If you’ve recently bought a pool or are thinking about doing so, you’ve no doubt heard a lot about pool chemistry. Maintaining the right chemistry in your pool water could be the most important job you’ll have as a pool owner. That along with proper sanitization is how you keep it crystal clear and safe for swimmers. But what is pool chemistry, you ask? It does feel a little science-y with the cool little beakers and test strips, but truthfully, it’s really not that hard. In fact, with a little help from us, you’ll be the Bill Nye of your back yard in no time! Before you know what all these fancy chemistry terms are, it’s important you know how to test them. Check out our infographic and guide to help you get started! A pH level simply refers to the acidity of the water. Low pH levels mean your water is too acidic and high levels mean it is not acidic enough. Having out-of-whack pH levels can irritate your skin and eyes as well as prevent bacteria from being killed off effectively. It can also wreak havoc on your pool surface or lining. Having it too low can cause etching on the sides or erode metal fixtures. But if it’s too high, you could develop scaling on the surface and plumbing. Your pool’s pH level should always be somewhere between 7.4 and 7.6. The problem is that these levels are affected by so many other factors that testing these levels is only a small part of the equation. It’s an unstable factor and can be affected by debris, rain, and anything else that slips in. It also messes with the effectiveness of your pool’s chlorine. Use your pool chemistry testing kit to determine whether or not your pH levels need to be stabilized. If it’s within the healthy range of 7.4-7.6, you don’t need to do anything. But if the water is off kilter a little bit, you will need a pH balancing chemical to get it back to where it needs to be. In order to raise your pool’s pH level, you will add either sodium carbonate or sodium bicarbonate (baking soda). Or to make things easier, you can simply purchase a chemical like pH Up that is made for that purpose. It might save you a little time since it includes directions on how much to use and how to use it. To lower a pool’s pH levels, add a chemical such as muriatic acid or sodium bisulfate. They should be easy to find in containers and will be called something like pH Reducer or pH Down. REVOLUTIONARY GRANULAR POOL pH REDUCER. Lower the pH of your pool, spa, or hot tub with Pool & Spa pH Reducer! This granular formula lowers high pool pH. SAFER TO USE THAN MURIATIC ACID. 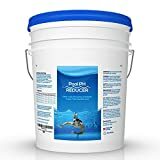 Pool & Spa pH Reducer is safer and much easier to store than muriatic acid, as it is non-toxic, non-caustic, and biodegradable. Simply follow the manufacturer’s instructions until your pool water tests within normal range again. 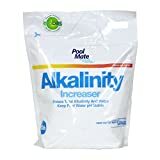 Because pH levels are so unstable, they need a sort of mediator, which is what alkalinity does. When your pool’s alkalinity is kept in balance, it helps regulate the factors that can throw your pH levels out of whack. A healthy alkalinity level for the pool is between 100 and 150 ppm. Most of the time, the alkalinity levels are too low if they are out of balance. In order to raise these levels, you will add sodium bicarbonate (baking soda). If by some chance, the alkalinity actually is a little high, you can add a little muriatic acid or pH reducer to lower it. 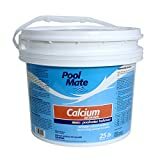 You might be wondering why you would need to monitor calcium hardness in your pool, but it’s a very important factor in keeping your water clean and your pool surface in good shape. Below these levels and the water becomes too soft. Soft water might sound nice, but the water feels slimy and it seeks out calcium by corroding your pool’s surface. To raise calcium levels, you will need to use an additive called calcium chloride. Anything above those levels means that your water is a bit too hard and will become cloudy and leave scaly deposits on your plumbing and filters. To lower calcium hardness, you can add muriatic acid according to manufacturer’s directions. pH, alkalinity and calcium hardness levels all play a very important part in keeping your pool clean, but that’s mainly because they help keep your pool’s sanitizing chemicals working the way they should. Maintaining clean pool water takes a little time and effort, but it doesn’t have to be hard. Sanitizing your pool is what keeps out the germs and algae that make your water murky and unhealthy. Chlorine is the main sanitizing agent used in pools because it’s the most effective chemical for killing bacteria and keeping algae away. But there are some others you can use as well. Chlorine. Chlorine is the chemical that keeps your water disinfected. Keeping it at healthy levels goes a long way toward keeping you or your pool maintenance guy from having to take drastic measures to remove unwanted substances such as algae. You can chlorinate your pool several ways, including liquids, tablets or granules to maintain a healthy level of 2.0 - 4.0 ppm. Biguanide. Biguanide is an effective alternative to chlorine but is a bit more expensive. It also cannot be mixed with other chemicals so you have to use their complete lines of algaecides and pool shock. 30-50 ppm is the appropriate level for biguanide. Bromine. Bromine is most often used when trying to avoid the strong chlorine smell. It’s not near as effective as chlorine but is sometimes used in hot tubs or indoor pools to avoid the strong chemical stench. It’s ideal level is 3-5 ppm. Sunlight is its enemy so it’s an absolute no-no for outdoor pools. Minerals. A mineral system for cleaning pools is considered a more natural alternative to chlorine. It usually contains copper and/or silver, which effectively deter algae growth. A mineral system still usually requires a small amount of chlorine, but what is considered a safer amount. It’s also measured a little differently. With a mineral system, you will just need to keep your chlorine level at about .5 ppm. Ozone. Ozone is active oxygen. Since the late 1800s, ozone has been used to purify water, mostly for drinking, but somewhere in the mid 1900s, it started being used to sanitize pool water. Ozone can be a great alternative to chlorine as it doesn’t irritate the skin and leaves no noticeable odor in the amounts needed for pools. You may still need to use trace amounts of chlorine with your ozonator to ensure that all the water molecules are sanitized. You may have heard the term “shocking your pool", an industry term for super chlorinating your pool. 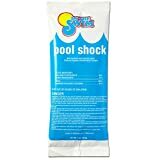 Pool shock is also the name given to the actual product used to achieve this. Shocking your pool on a regular basis helps to kill bacteria that regular chlorination might miss. Keeping your chlorine levels balanced goes a long way toward making sure your pool is bacteria and algae-free, but there are always some algae spores and bacteria that are more resistant to chlorine than others. That’s where pool shock comes in. Super chlorinating your pool will kill off anything that lingers and make your daily chlorine levels much more effective. Each product comes with its own instructions, but a good rule of thumb is to bring the chlorine levels up to 40 percent of the cyanuric acid level in your pool. There are also non-chlorinated pool shock products you can buy, which work by oxidizing and clarifying your pool. 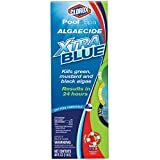 It’s not quite as effective as chlorine on most algae, but it’s a good product to use in between chlorinated shock treatments to keep things clean when no algae has been found. It’s also great because you can resume swimming within 15 minutes after using it. Most pool experts recommend shocking your pool once a week, but at a minimum, it should be done every two weeks. While algae is not harmful to humans in and of itself, it can certainly muck up clean water in a hurry and harbor nasty bacteria. An algae overgrowth can also throw your pool’s chemistry off balance, making the problem worse. Chlorine is the best anti-algae treatment available, but some forms of algae are more resistant than others, making further treatment necessary. There are three main types of algae people find in their pools—green, black and yellow—but there are literally hundreds of other species to look out for. When looking for algae, be sure to check all the places it likes to hide, like corners, cracks, pool steps, and ladder rungs. This is important not just for cleanliness but also safety. An algae growth can make things pretty slippery and unsafe for swimmers. Green algae. Green algae is the easiest form of algae to get rid of. It’s also the most common. It’s easy to spot because of its color either floating on the surface or clinging to the sides or pool toys. Usually green algae can be nipped in the bud with your weekly shock treatment, but if you notice it sticking around, a little algaecide should do the trick. Yellow algae. Also sometimes called mustard algae for obvious reasons, this one’s a lot harder to get rid of. It’s also more difficult to see because it looks a lot like specks of dirt or sand hanging around the cracks and crevices of the pool. Shocking your pool is likely the only way to get rid of this pesky little growth. You’ll also probably need to do some heavy duty scrubbing with your pool brush to remove it from the pool’s surface. Black algae. Ah, the dreaded black algae. When people see this in their pools, they automatically think swim season is over, but it doesn’t have to be. Black algae is the hardest to get rid of because it often takes root wherever it is and has a protective coating on the top that makes it resistant to chlorine. Hopefully when you spot black algae, you’ve caught it early and can kill it with some heavy brushing and a couple of shock treatments. If it gets out of hand, however, you will have to drain your pool and treat it. You can also vacuum your pool manually to keep algae at bay. Algae and other bacteria have a hard time taking root and spreading when the water is constantly moving. Filtration, circulation and flocculation all play an important part in keeping your pool clean. A good filtration system keeps the water moving and circulating. This is important for a couple of reasons. For one, circulating the water keeps it moving through the filter, filtering out spores and debris. Secondly, it keeps the chemicals well-dispersed throughout the pool. Flocculation is also a big factor in keeping the water healthy. Flocculation is a term for a process that basically coagulates any debris in the pool, settling it to the bottom, making it easier to clean up. It’s crucial because small debris and algae particles are often left behind in the normal filtration process and they can start to get out of hand before they’re removed. Pool chemicals can be dangerous to humans, pets and surfaces if not properly handled. The best way to avoid injury is to carefully follow all manufacturer directions and educate yourself on the dangers of certain substances. Not only do you need to use precautions when handling pool chemicals, you also need to make sure you are storing them correctly. The CDC recommends that all pool chemicals be stored at a temperature below 95°F. They should also be stored in a dry place away from direct sunlight. Cover containers tightly and store them separately. Most manufacturers list specific handling instructions, but it’s always best to err on the side of caution when using dangerous chemicals. Understanding pool chemistry is an important step to becoming a responsible pool owner and making sure your family gets the most use out of it. And testing and balancing doesn’t have to be left to the pros. With a little bit of know-how and willingness to get your hands dirty (or clean in this case), you can take care of all the maintenance yourself. Just remember to keep a good testing kit, the right chemicals and appropriate protective gear on hand to make your weekly maintenance tasks easier.